It may say "Stax" on the cover, but this new box set of Elvis music from RCA offers up a different kind of soulfulness. Elvis makes a different kind of Soul music down on McLemore Avenue. Thousands of music fans still commemorate the day -- August 16, 1977 -- when Elvis Presley died in Memphis. They travel to his house for the annual candlelight vigil, or erect shrines to The King. It's also an occasion for record companies to re-release old Elvis albums in new packages. Getting a lot of attention this year is a new box set from RCA commemorating the 40th Anniversary of several Memphis recording sessions that still leave some music fans yearning for what might have been. And that's because those recordings were made at Stax Records, the studio that churned out soulful hits such as Otis Redding's "Dock of the Bay," Booker T. and the MG's "Green Onions" and Sam and Dave's "Soul Man." From 1957 to 1975, Stax Records on McLemore Avenue was ground zero of southern soul music. So on a summer night in 1973, when Elvis made the five-mile trip from Graceland to the famous recording studio, it's enticing to imagine the King of Rock and Roll en route not just to a legendary temple of sound, but also to a recording session with possibly career re-defining implications. What happened next has now been meticulously cataloged and re-discovered in the 3-CD RCA box set "Elvis at Stax." Music writer Robert Gordon, author of the books "It Came From Memphis" and a forthcoming history of Stax called "Respect Yourself: Stax Records and the Soul Explosion," says that Elvis' appearance at Stax was motivated in part by business. He had just wrapped up his mega-hit "Aloha in Hawaii" television concert and sold his back catalog of music, freeing him up to sing more of the music he loved. "In 1973, Elvis has reached the globe in one concert, created a clean slate for his recording catalog, and created a publishing system that should enable him to get first class material," Gordon said. "So there's this moment of psychological freedom and business opportunity." But in the midst of all this, Elvis' personal life was in shambles, which Gordon says is reflected in his song choices. "I read them all as intensely personal," Gordon said. "I read them all as sung to his soon to be ex-wife, his child, or his girlfriend. They all are imbued with the personal trauma he was going through." On one out-take of the song "For Ol' Times Sake," his voice seems to falter under the weight of his personal struggles. After 11 takes of that song, Elvis left the building. He canceled the remainder of the summer session. Some music critics speculate that the tunes were giving him the blues. A few of the musicians had their own reasons for feeling under-whelmed. On that final day of recording, three Stax legends were in the studio, drummer Al Jackson, bass player Donald "Duck" Dunn and guitarist Bobby Manuel, all of whom were dying to hear the King cover soul classics like "Dock of the Bay" or "Soul Man." Instead, they found themselves backing inconsequential pop numbers like "Girl of Mine," which would take a stretch of the imagination to find the Memphis soul in it. Bobby Manuel, who is still recording and playing, believes that the King missed a great opportunity. "We were told that the main reason he wanted to come there was to do some of the Stax catalog," he said, adding that if Elvis had covered Otis Redding or other Stax artists, he might have reached a whole new market. 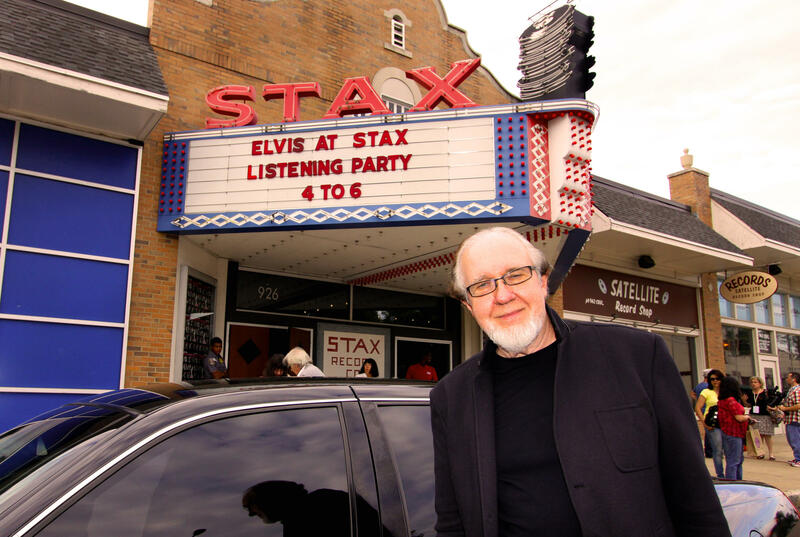 Five months after his first visit, Elvis returned to Stax. But this time, he stacked the deck with his favorite musicians. Norbert Putnam played bass on the December recording session that Elvis held at Stax Records in 1973. Putnam is seen here at the album release party for "Elvis at Stax" on Tuesday, where he took part in a panel discussion. Bass player and record producer Norbert Putnam, who'd recorded extensively with Elvis in Nashville and is a progeny of the funky Muscle Shoals studio, said he too arrived with soulful expectations. "It was something I was really looking forward to," Putnam said. "I loved Sam and Dave, Otis Redding, Booker T, Isaac (Hayes). All the great people. I had all those records. I couldn't wait to see what Elvis would do. If the room really had magic." Even though Elvis was in better spirits, Putnam saw that the King was still in troubled waters. "He'd just come through the divorce with Priscilla," Putnam said. "I think it had been weighing heavily on his mind. But as soon as we started to play, he came alive, he got into it. He sort of immersed himself in the music. And we got 18 tracks out of it." Soon into this second session, Putnam noticed there was virtually no real soul music on the line up. Instead, Elvis was being fed tunes by his management, a few of which he'd never heard before. On some occasions, Elvis would listen to a demo version of a song recorded previously by sound-alike Elvis singer. The band would sketch out the chord progressions on yellow note pads. Then, with virtually no practice, they'd start recording. What Elvis' management really didn't like, Putnam said, was when the musicians would slyly try to get Elvis to sing a number that wasn't on the docket. "(Guitarist) James Burton would start playing an old Chuck Berry riff and Elvis would say, 'What is that?' and he would say 'Promised Land." (And Elvis would say), "I love that! We're gonna do 'Promised Land.' And suddenly we're doing that song. There were many instances when some great old standard would come up and ten minutes later we were recording it." As it turned out, his impromptu version of "Promised Land" remains one of the session's biggest standouts. Gordon said there was certainly a shift in tone between the July and December sessions, which he attributes to Elvis starting to get his personal life back in order. But there are still some darker spots, like the tune "Good Time Charlie's Got the Blues." "It's a really personal song, right?" Gordon said. "Elvis is Good Time Charlie. He's the guy everybody hangs around with to have fun with and now he's going through a divorce. I like to read all these things into it." In several ways, Elvis' recording at Stax was the great studio album that never was. For one, the tunes were never packaged together or marketed with any Stax affiliation. They were parceled out in two albums that looked a lot like the other Elvis albums of the 1970s, except that he is wearing different jumpsuits. The new box set, "Elvis at Stax," corrects that error by unifying the masters and a number of out-takes. 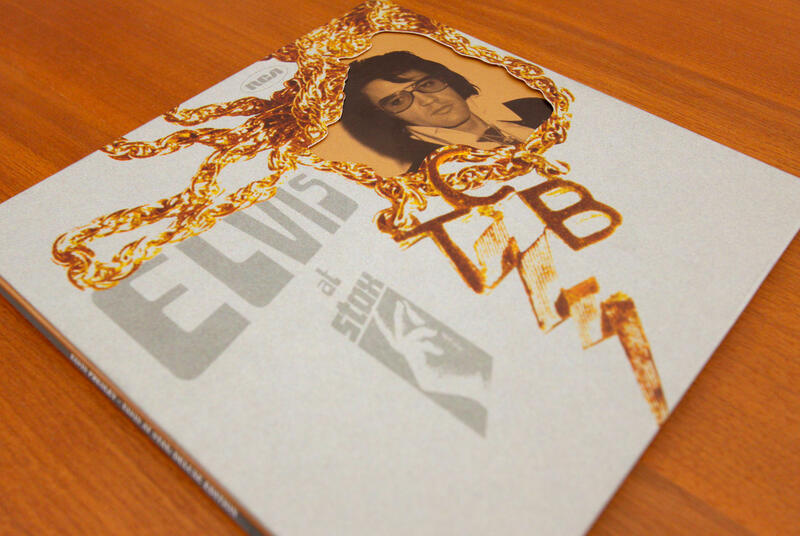 On the cover, a thick gold chain encircles a picture of Elvis with a deeply introspective expression. It's the actual content of those sessions, however, that still have music scholars asking: what if? "Elvis at Stax is not the record that, you know, he does Memphis soul," Gordon says. "We can only long for that. Probably with technology like it is we can, you know, fashion a semblance of what it would be, but that's not what this record is." Still, Gordon concludes that Elvis at Stax is soulful in a different way. A snapshot of a man at a crossroads in his life. "Another artist doing these sessions, we'd could look back and say 'Wow man, that was the highlight of his career,' but Elvis you go like 'well, yeah it's great, but it's not like "Suspicious Minds," it's not "That's All Right Mama," it's not "If I Can Dream." So it's just another reminder to us, as fans, how high a bar Elvis set for his own work."